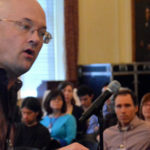 Following a successful inaugural event in 2013, NYU held its second annual IT UnMeeting on January 15th at the NYU School of Law’s Greenberg Lounge. TorchTech events have included such occasions as the IT UnMeeting, a freeform technology conference; a panel discussion on cloud computing involving speakers from Amazon and Google, and a Networking Breakfast. 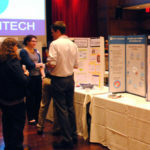 Their fourth event, the IT Share Fair, was held on September 30th at the Kimmel Center. 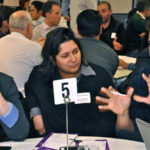 On January 21, over 120 people from across the University came together for NYU’s first-ever IT “UnMeeting.” While it may have initially seemed like any other University-sponsored get together, when it was time to go over the agenda, it was immediately apparent things were going to be different.